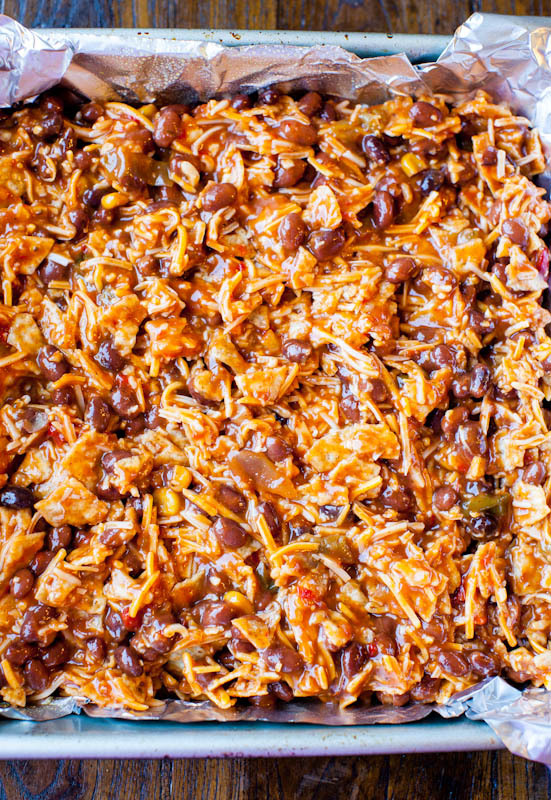 If you ever want to eat nachos for dinner and call it a meal, this is your chance. I have memories from junior high (and college) of taking Doritos and laying them on a plate, adding shredded cheese or any kind of cheese I could find at the moment, and nuking the plate until the cheese bubbled like crazy in that very uneven microwaved-heat kind of way. This is the grown up version of that. It doesn’t begin with Doritos, but instead with white corn chips. Better? Maybe? Not sure if corn chips are any better than Doritos. I love both. 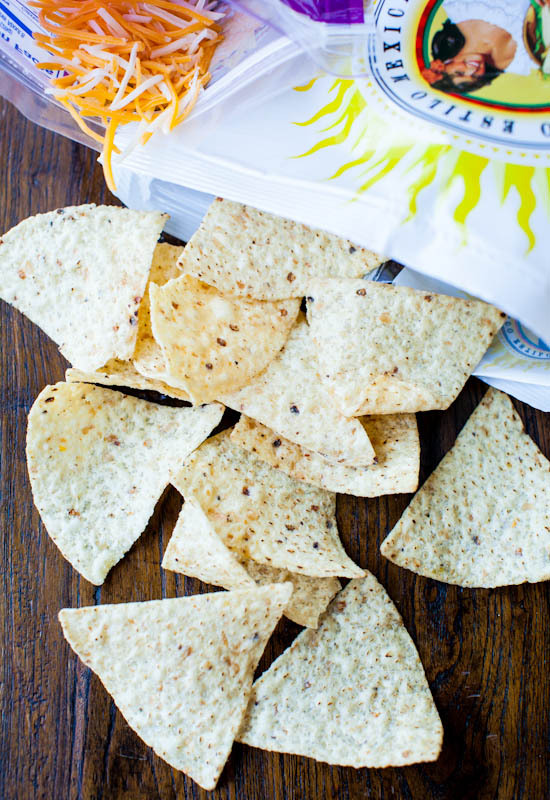 For this recipe I used these Santitas white corn triangles. Two bucks for a big bag, readily available at almost any grocery store, and they have perfect amount of oil, salt, and crunch. Guacamole anyone? They’re my fave for guac. 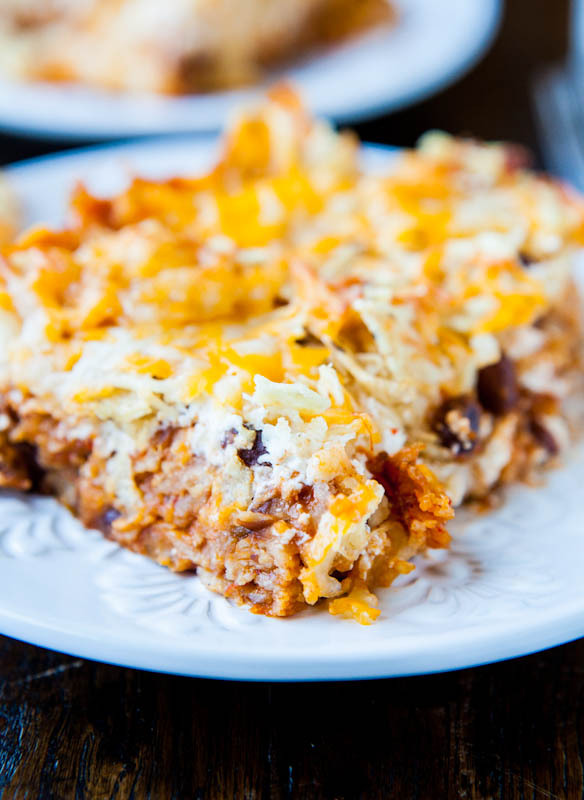 Or how about a casserole made with said chips and shredded cheese and chili. This is a freezer-friendly and family-friendly recipe. It’s also vegetarian (and vegan if you use vegan cheese and vegan sour cream). It’s gluten-free, and packed with protein. Beans, beans, great for the great source of protein. I only made a 9-by-9-inch pan but this makes plenty of planned leftovers, which I promptly put into a Glad Freezerware container. I took the leftovers from refrigerator or freezer to microwave to table to dishwasher. Simplicity. A beautiful thing. I used corn chips but use what crunchy items you have on hand. Potato chips, Doritos, corn chips, saltine crackers, pretzels; the bottom of your half-opened bags of this’es and that’s are perfect here. Same goes for the mixture of beans, chili, salsa, or red pasta sauce used. That random jar of red peppers, canned corn, black olives, or whatever it is you need to clean up and out of your pantry or freezer, toss it in. This is a very flexible recipe. Take five or six big handfuls of chips and put them into a bowl and chop-chop-chop with a wooden spoon, crushing the chips into dime size pieces. I almost felt bad taking perfectly-formed whole chips and crushing them. 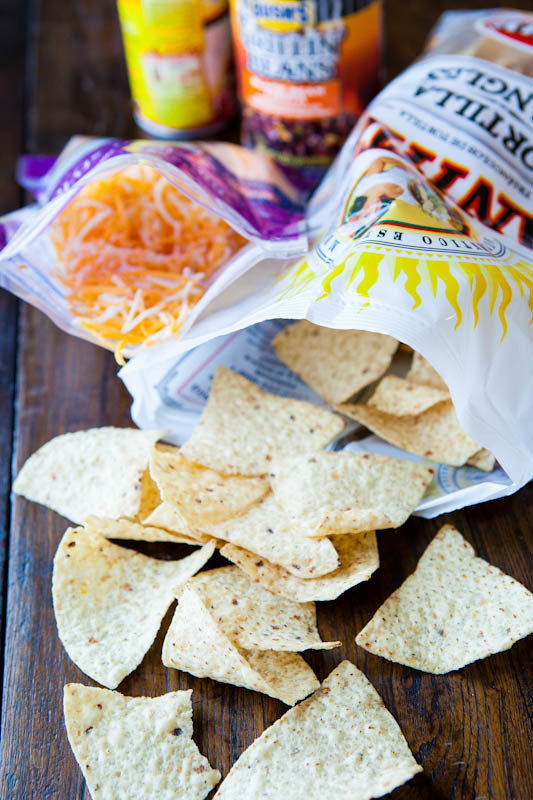 Where are those bottom-of-the-bag-chip-crumbs when you need them? To the chips, add a can each of chili, beans, and salsa. Or whatever it is you want to use. As noted in the recipe section, ripe with options and substitutions. Add a couple big handfuls of shredded cheese to the mixing bowl and give it a stir. Pour it into a foil-lined baking pan. Do not skip lining your pan with foil or you will literally have a hot mess on your hands when it comes time for the dishes. Nachos and melted cheese is great in your mouth. Not on your bakeware. 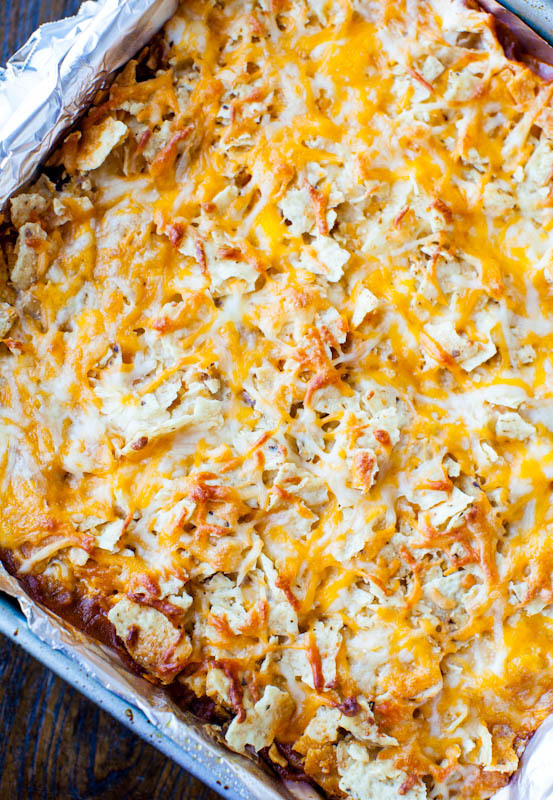 Bake for 20 minutes, top with a layer of sour cream, add more chips ‘ n cheese. Bake again for 10 more minutes to get a nice browned top to your casserole. The microwave can’t make nachos like that. This is perfect tailgating food. It’s May and not November, I realize that. But there is never a wrong month for chili and chips and cheese. 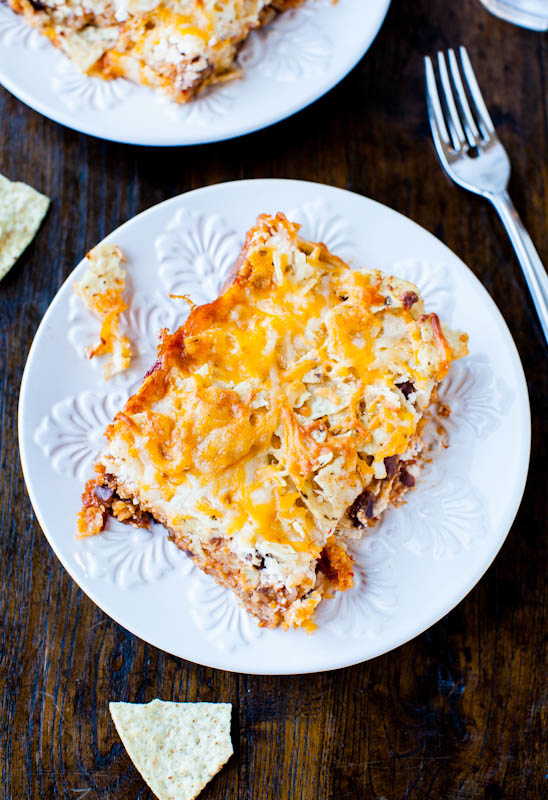 Or for nachos-for-dinner disguised as a casserole. Or for meals that make planned leftovers. To say the family went ga-ga for this is an understatement. And like most lasagna, spaghetti, or chili recipes, this got better the second and third day in the refrigerator as the flavors married. 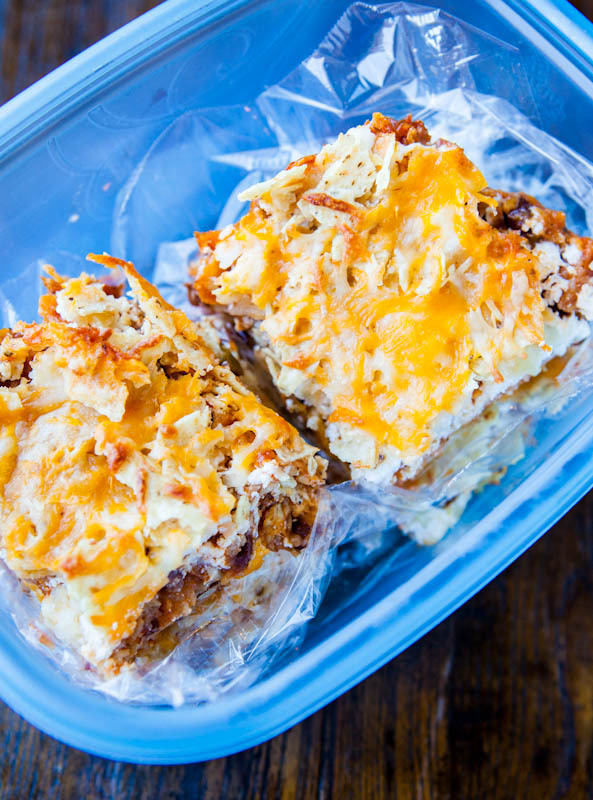 One tip to perk up re-heated leftovers is to garnish with a dollop of sour cream, salsa, or a sprinkling of fresh cheese. 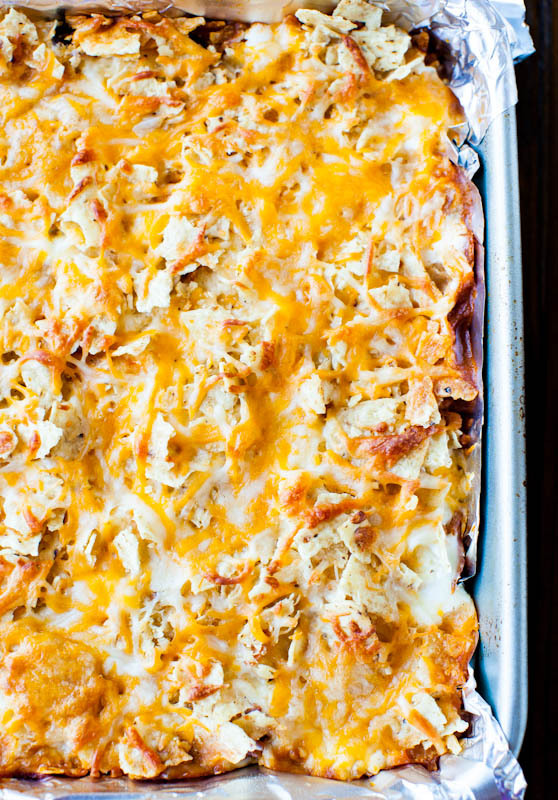 An easy and hearty casserole the whole family will love. 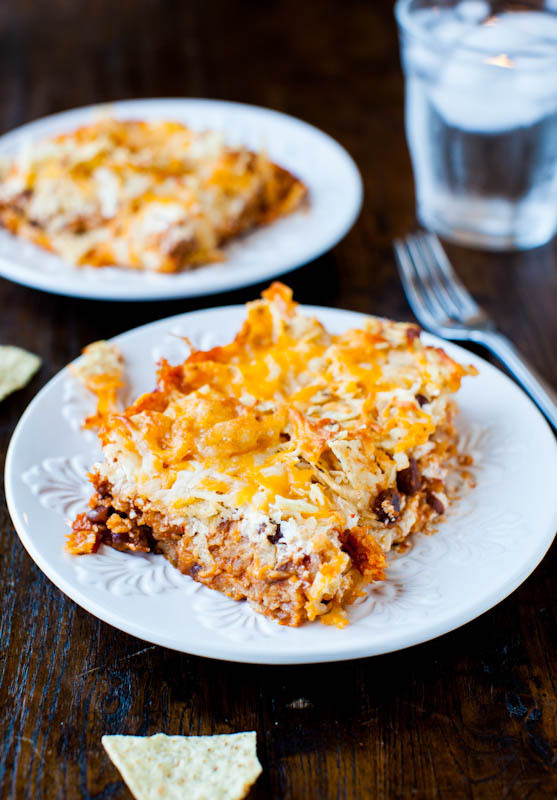 It reminds me of chili nachos that meets a pan of lasagna on the way to the oven. 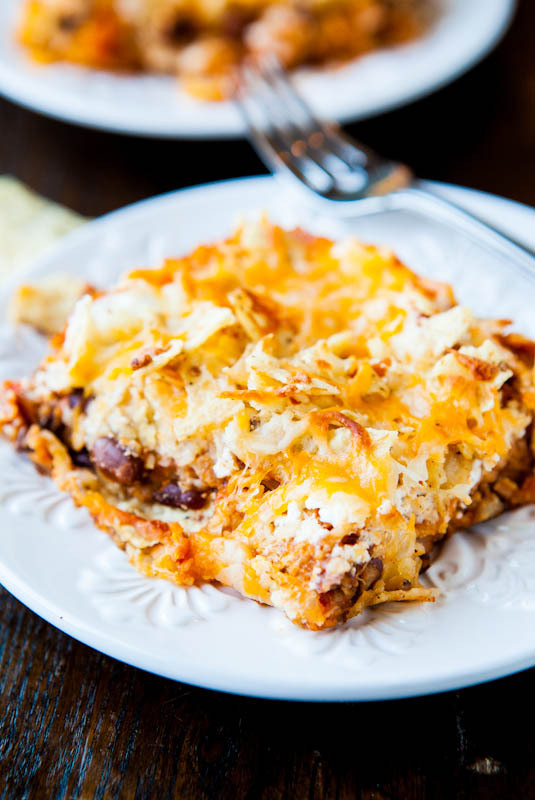 Great for planned leftovers and always a hit with sports fans for tailgating, Superbowl parties, or any time you need a warm, comforting dish. Preheat oven to 375F. 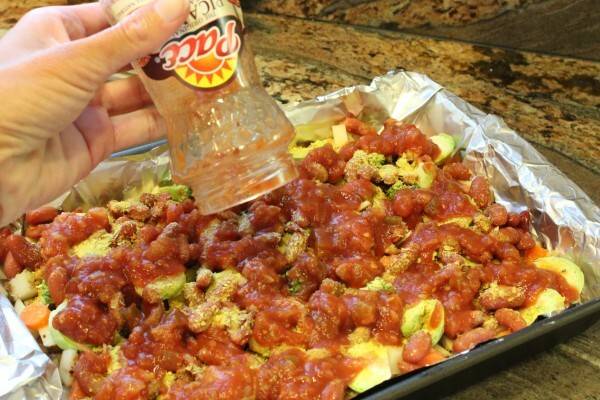 Line a 9-by-9-inch baking pan with aluminum foil, spray with cooking spray, and set aside. 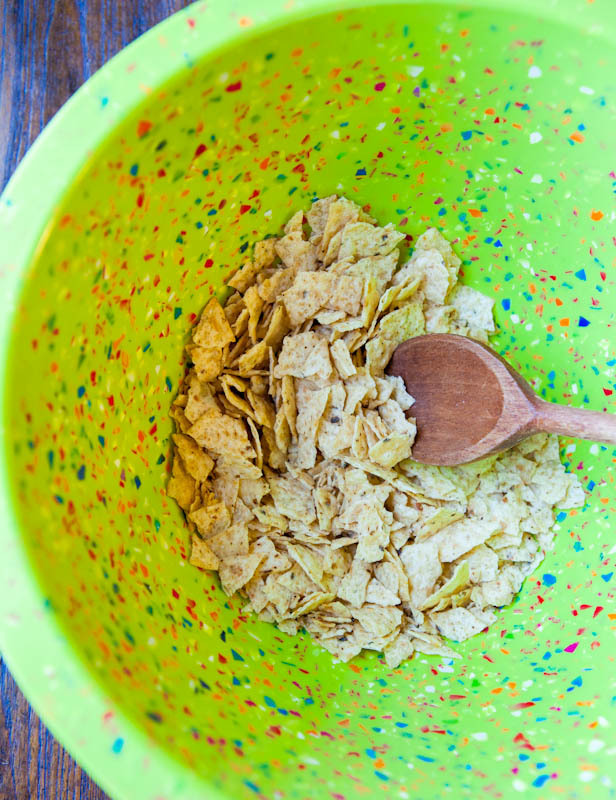 In a large mixing bowl, add 5 to 6 cups chips (about 5 big handful of chips from the bag) and with a wooden spoon or similar, poke and crush the chips to the size of a dime. You don’t want powder, but make them small. Add the chili, beans, salsa, 2 loosely-packed cups cheese (about two-thirds of the package), and stir to combine. Pour mixture into prepared pan and bake for 20 minutes. After 20 minutes, remove pan from oven and spread sour cream in an even, flat layer over the casserole. Sprinkle 1 to 1 1/2 cups loosely packed cheese (the remaining cheese in the package) evenly over the top of the sour cream. Sprinkle 1 to 1 1/4 cups crushed corn chips over the top and bake for 9 to 12 minutes, or until top is browned to desired level. Serve immediately. Optionally, garish with a dollop of sour cream, a sprinkling of cheese, or a pinch of chopped cilantro or onion. Store leftovers in a Glad Freezerware container or similar airtight container in the refrigerator for up to 5 days or in the freezer for up to 3 months. Notes: Recipe is highly adaptable based on what kinds of canned goods you have on hand. Aim for about 30 ounces of wet ingredients, i.e. one 20-ounce can of beans and a 10-ounce jar of salsa. One 20-ounce jar of red pasta sauce and one 10 ounce-can of beans. Based on how chunky or wet your batter mixture is before baking, you may need to adjust baking times slightly. Bulk this up with canned corn, fresh or canned bell peppers, crushed tomatoes, or almost any vegetable you have on hand; add crumbled tofu, tempeh, pre-cooked meatballs, soy meatballs. Get creative. *To keep vegan, use vegan cheese and vegan sour cream (or thicker-style vegan yogurt). Take care all ingredients used are suitable for your dietary needs. Are you a fan of nachos? Chips and cheese? I really don’t think there’s anyone who doesn’t like them but I’d love to hear your favorite combinations and recipes. 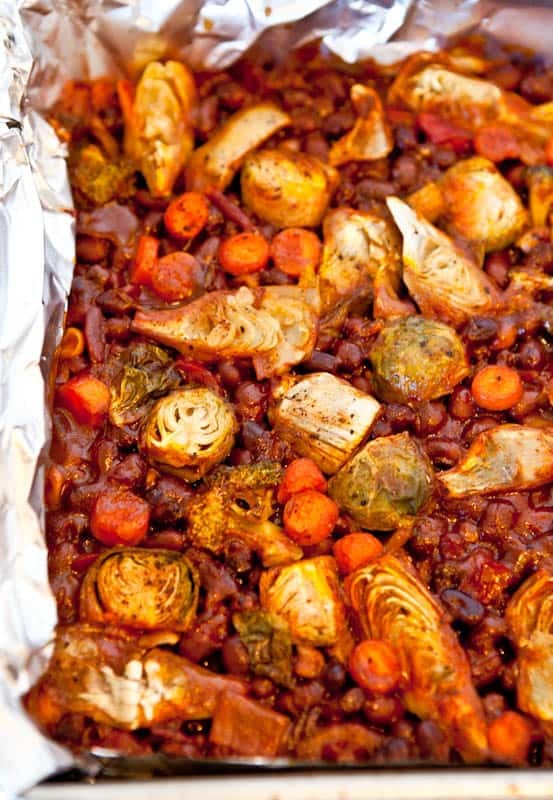 Do you have a favorite casserole or freezer-friendly meal that makes planned leftovers? Until I had a family I really wasn’t that into leftovers and didn’t see the big deal about make-ahead meals. I see the big deal now. They are such a time saver and even if I didn’t have a family, the whole “cook once, eat twice” strategy would be in full-swing. Knowing I have something in the freezer or fridge already made and all I have to do is re-heat it, makes the dinner hour so much more sane not having to start from scratch. Add a salad and dinner is ready. 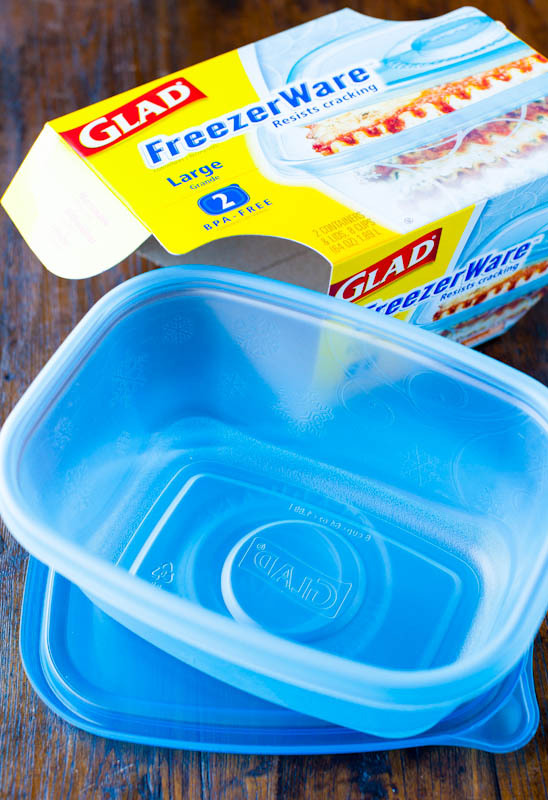 As part of the Foodbuzz Tastemaker Program, I received a stipend and coupons for free Glad® FreezerWareTM containers. Question… for the 10 oz of black beans, red beans, refried beans, beans medley. Do you mean a can of each? No, just one 10-oz can total of the beans and you can use any bean combo you want (sometimes people say well I don’t like black or red, etc and this way you can use whatever kind you like) and then the 10 oz can of chili. And really, the can sizes are approximate. If one is 12 oz and the other 10oz; or 8 oz and 12 oz, you’ll be fine :) LMK how it works out for you! In the oven right now and it smells so good! I used the Doritoes Jacked Enchilada Supreme chips and I’m excited to see how it turns out! I didn’t even know that chip existed! I love Doritos and don’t even buy them b/c I love them too much! 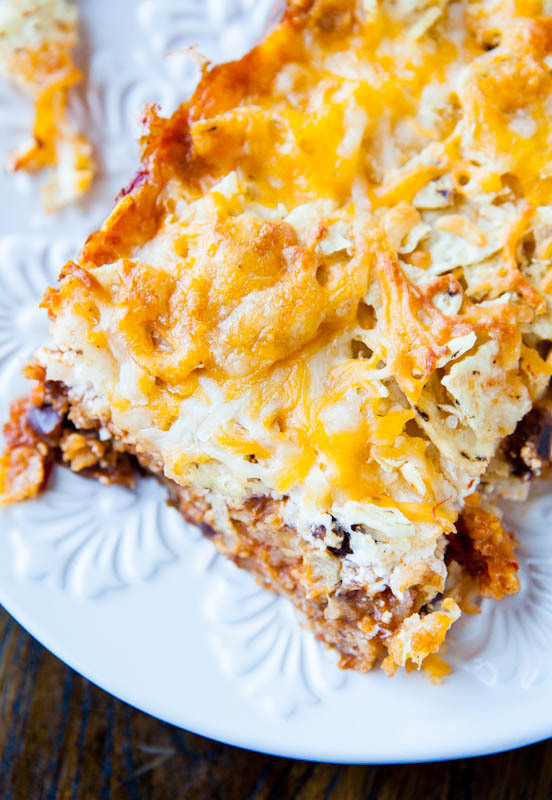 :) I hope you love the casserole…keep me posted! 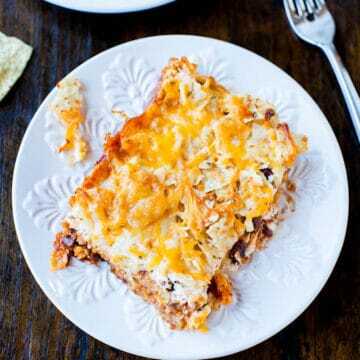 I made a vegan version of this for my omni family the other night using Daiya Cheddar Shreds and Tofutti Better than Sour Cream. Every last bite was scraped out of the pan, it was perfect for 3 picky kids! Thanks Averie for the great recipe. I am so glad that it was a hit, for 3 picky kids no less! And that you kept it vegan – nice work, mama! Thanks for LMK you tried it and so glad it was a winner! This was great. I’d been struggling on what to cook for my omni family (I’m vegan) and this was perfect. Everyone cleaned their plates! That’s awesome, Gabby! Glad you and your family liked it and that there were Clean Plate Club Members! Thanks for coming back to LMK! All lovely recipes. Thank you and Happy Tuesday to ya! In your Chips and Cheese Chili Casserole the ingredients calls for one 8 oz. package shredded cheese (2 c.) but your recipe calls for 3 1/2 c. of the cheese. So I am guessing it should be 2 of the 8 oz. packages roughly? I am going to try something like it tomorrow night. I have a bunch of leftover chili but I am going to slice packaged polenta on the bottom of the casserole I think. Thanks for the recipe! 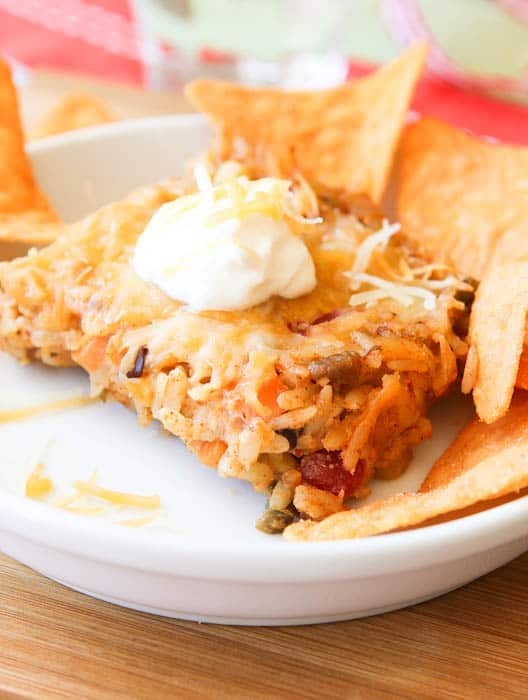 In your dish, did you used retried beans? I think I spy both red and black beans in it? It looks so very tasty that I want our first try to look that amazing! My kids are standing over me saying “make that for dinner tonight pleeeeeaase! I used black and red beans in a canned bean medley I had on hand, but no refried beans.